This insect was found on Desert Hackberry -- Celtis ehrenbergiana Sept. 2007 in the Goldfield Mountains, eastern Maricopa Co., Arizona, USA. Scale insects are among the most peculiar insects, because they just don't look much like insects. In fact they may not appear do be alive at all. 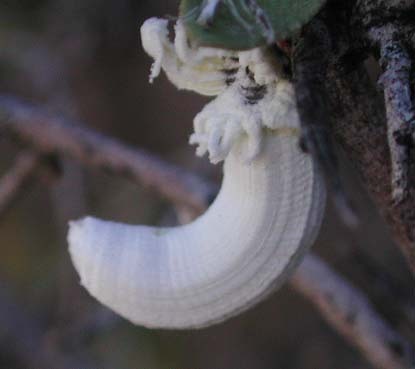 The curving white column is made of wax secreted by the insect and is affixed to the abdomen and back. In this case it is filled with eggs laid by this female. She clasps a twig so closely that the tiny legs, located near the top in this picture, are hidden. Most scale insects are smaller than the one photographed, which was close to 2 cm long. Scales are true bugs and lead a largely sedentary life drawing sap from their host plant, in this case a desert hackberry, Celtis pallidum. When the eggs first hatch they give rise to minute legged versions called crawlers that can get knocked or blown from plant to plant. Once they settle down onto a new host their legs become pretty much useless. The possible identity of the specimen at left was provided by Takumasa (Demian) Kondo, Ph.D., U.C. Davis. It is similar to the Cottony Cushion Scale (Icerya purchasi) an important, exotic pest species. The example below (thumb link) was found on Mimosa near Seven Springs, Maricopa Co., Arizona.